Sarah Said has fifteen years of experience working with English Learners in the Chicago land area from all parts of the world as a teacher, building administrator, and District Level Director of English Learner/Bilingual programs. In her current role as a district level director, Sarah oversees three types of bilingual programs in addition to English Learning programs. She has worked with students of multiple language groups, but her experience really shines in working with Arabic speakers. She has worked at every level in some capacity from ages Pre-Kindergarten to adult. She has facilitated workshops and have given presentations on a wide variety of topics from Cultural Responsiveness to working with Students who have Limited or Interrupted Formal Education. Her expertise ranges from program development to Sheltered Instruction Observation Protocol to accommodating students of refugee status. Sarah has her B.A. in English Education and her M.Ed. in Instructional Leadership with a focus on Literacy, Language and Culture. She also has a Master’s degree in Educational Leadership. Sarah is an advocate for equity in schools and strives to give the best to all students. Ramadan is a time when the Muslim Community rejuvenates itself by plunging deeply into faith and harmoniously unifies itself by fasting and holding longer prayers. Families make more time to eat together after sundown and practice faith together. The community grows together to become more pious at this time. This year, the month of Ramadan will start on the evening of May 15th, 2018. Muslims practice the month of Ramadan because this is the time in which the Quran was revealed. The month starts with the new moon and ends with a full moon. It is the ninth month of the Islamic calendar. During this time, Muslims fast from sun up to sun down (they go without food and water), pray more prayers than the obligated five a day, and give charity. They do this to cleanse themselves spiritually and remember the less fortunate. The month is inspirational in helping Muslims strengthen their faith. It is a joyful time within mosques across America. For a Muslim child attending public school in the United States, it is a great time, but not always an easy time. With balancing school work, fasting, and prayers students can struggle during the month of Ramadan. This blog post will give educators ways to learn about students and support them during this time of the year. I am a Muslim. I am an American. I am a Product of the American School District. I am an Educator. I am a School Leader. I am proud to be of all of these titles. 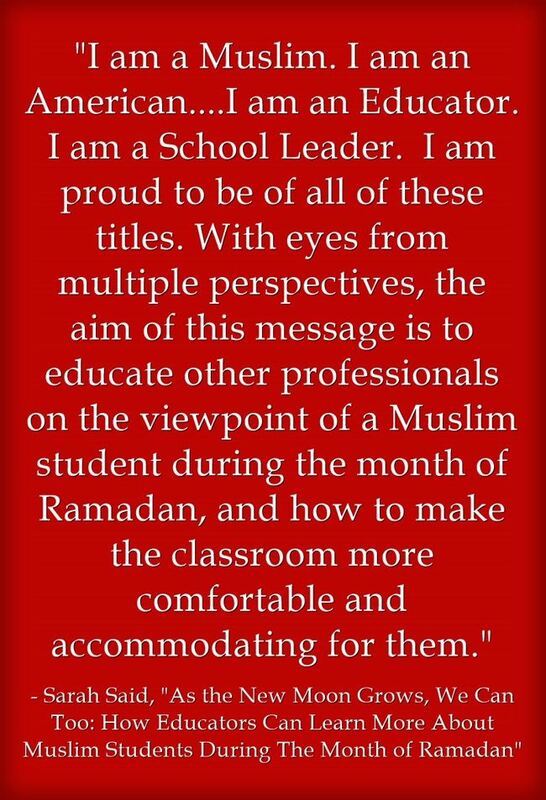 With eyes from multiple perspectives, the aim of this message is to educate other professionals on the viewpoint of a Muslim student during the month of Ramadan, and how to make the classroom more comfortable and accommodating for them. I hope this message reaches all in diplomacy, and inspires others to build stronger bonds with students and their families during this month. In my experience as a child during this month, I had wonderful educators who did their best to accommodate and try to understand my family’s traditions. I also had others who didn’t really understand the purpose of fasting and in a sense made me feel like what I was doing “wasn’t right.” Typically you see students starting fast around fourth or fifth grade. Children start to fast during the month of Ramadan when they are able to fast. Yes, it may not seem appropriate to see a second grader go without food and water during the school day. However, the child may have seen their older siblings and parents fasting and may have chosen to fast on their own accord. My own kids did “half days” when they were younger. This means that they just skipped lunch. It was their choice, What all of our families and children do on a day to day to basis to worship with their faiths is not bad, it’s just different. What matters is that children are happy and also physically and emotionally safe. Ask Questions, Just Think About What You Ask: If you have questions about the month it is okay to ask the child. But, how you ask those questions can really impact a child. 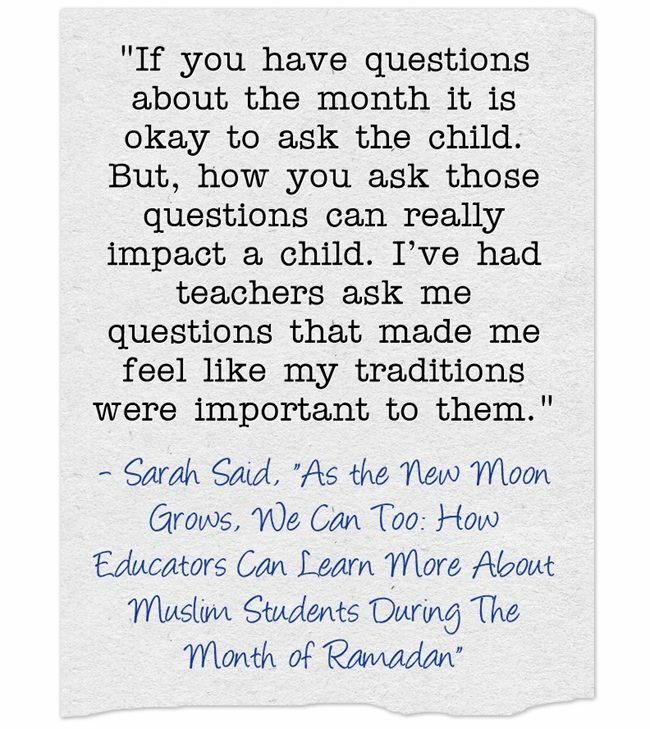 I’ve had teachers ask me questions that made me feel like my traditions were important to them. And, I have had teachers ask questions that made feel like I was “weird” and made me question what I was doing. Faith is a choice that a public school teacher should not try to impact or change. Questions like: “What does your family do during the month of Ramadan?”, “Do you have special traditions on Eid?”, or “What does your family cook during Ramadan?” are great questions to ask. Also, having a child explain what fasting is not only important for learning but also important for a student’s well being in your classroom. There are questions that help educators learn more, but there are also questions that make students feel uncomfortable. There were certain questions that adults had of me as a kid that were just not right to me. “What? You really can’t drink water?” and “What do you mean you don’t know what day your Eid holiday lands on, How do you not know that?” Okay, so we don’t drink water from sunup to sundown. This is not some weird phenomenon. This is what we practice, and the estimated one billion or so Muslims around the world who fast typically survive. Also, our holiday is dependent on the phases of the moon. We don’t know the exact day that the Eid holiday will land on because it is dependent of the citing of the full moon. Please do not make a child feel like something is wrong with them because they cannot tell you the exact day they are going to be absent. Some Muslim communities across the country have a calendar where with scientists they have predetermined the day of the Eid holiday, where others rely on the citing of the moon. Understand: During this month students fast from sunup to sundown. They also attend night prayers with their families. Yes, they should be obligated to do their school work. During this month, you still need to be business as usual with your studies and your day to day job. However, you could see a student put their head down in class because they are tired. Try to find a way to keep the student engaged in class. They are exhausted and giving them engaging activities and brain breaks can keep them focused. Of course, this is best practice for any student- fasting or not. Accommodate: I would not advise a Physical Education teacher to force a student to run the mile during PE class. Yes, if there is light activity they can participate. My son chose to play in a basketball league during Ramadan. When things were too much, he knew to stop. However, a grueling activity may do more harm than good. Offer a student an alternative assignment to running the mile if they don’t feel comfortable with it. A high school Physical Education teacher handed me writing assignments about the content we were learning in class instead of running the mile. This was fine for me and the other Muslim kids in my class. Also, know that students will need an alternative place to sit during lunch time. As a Muslim teacher in a public school, I gave up my lunch period for students who were fasting. Students either did homework or watched Disney movies in my room. Not all schools have staff members that can stay with students. My children are accommodated by their principal by being able to sit in the library because it always has supervision. There are students that may go to lunch anyway to socialize with friends, this is okay. Leave it up to the student. Students may also want a space to complete obligatory prayers. I have seen schools provide the back of the library for this. I have also seen classroom teachers supervise prayer during a study hall. A private space where there is adult supervision is important for this. Kids will need time beforehand to wash for prayer. This whole process should take more than 10-15 minutes. Adults should not remind kids about prayer, direct them how to prayer or pray with them in a public school. For the reader, I am giving you this information with the assumption that you could have students who request time and space to pray. Build Bridges: Some teachers and schools make the choice to not highlight any type of religious holiday or tradition. This is okay. Other schools make the choice to highlight every holiday. For some schools, that can be a lot of holidays, If your school makes the choice to highlight holidays, please do not force a child to get up in front of the class to explain the holiday to their peers if they don’t want to. Some children feel very comfortable doing this, others do not want to be the spokesperson of their entire faith. There are others who thrive on that. One of things I dreaded about fasting in school during Ramadan as a kid was having that one teacher who would make me get up and explain it to everyone. Then the teacher would just move back their lesson. We don’t ask kids to get up and explain Christmas, do we? We read books about Christmas, make crafts, and sing songs. I would recommend either showing the class this video (appropriate for grades 4-12) What is Ramadan? or reading the books Ramadan Moon by Na’ima B. Roberts and Shirin Adl (appropriate for grades 2-4), It’s Ramadan Curious George by H.A. Rey and Hena Khan (appropriate for grades Prek- 1) These are resources that explain Ramadan to kids, are pretty accurate, and are public school appropriate. Also, a lantern or paper star would be an appropriate craft for the month of Ramadan, if chose to take your building awareness of it further. It’s would be great to have activities where kids compare all of their holidays that the celebrate. Always know that you have parents who know your classroom and communities. Working with families is a great way learn more about any holiday or tradition. They may have great ideas for you. Also, some local mosques hold dinners for educators in the community to teach them more about the month. It is important to make our classroom as culturally responsive and comfortable for all. 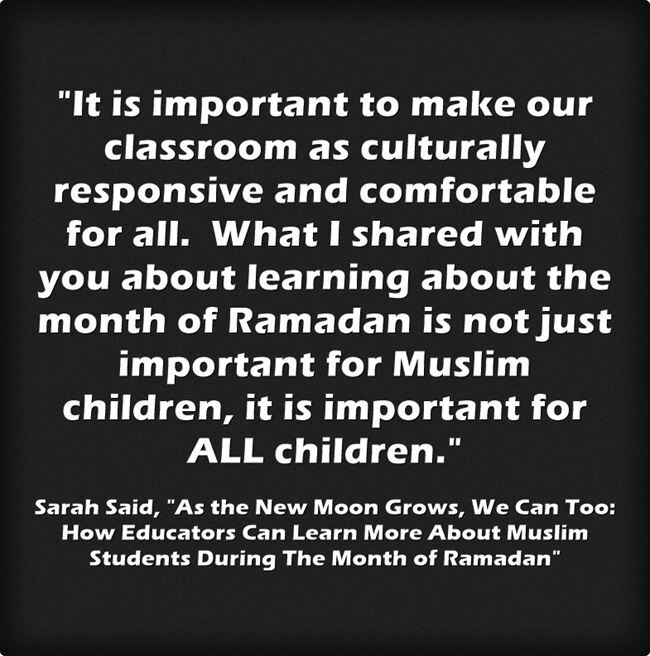 What I shared with you about learning about the month of Ramadan is not just important for Muslim children, it is important for ALL children. The strategies I share with you support Muslim and Non-Muslim children. Always remember to try to learn more about the students and communities you serve. Just always try to assure that the way you are doing it makes others feel respected and uplifted. Remember, the more you try to learn and understand students and their traditions, the more likely you will build a better relationship and grow as the new moon grows full. PreviousExcellent Free Online Professional Development For Teachers!